Actvity Summary: This poster won a 2008 Distinguished Achievement Award from the Association of Educational Publishers. The Sea90E poster – written for middle and high school students – introduces what a site survey cruise is, what it does, and the kinds of information scientists gain from it. 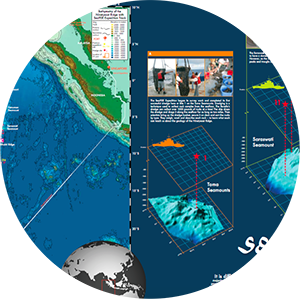 Showcasing the expedition of Deep Earth Academy’s 2007 Teacher at Sea, Rory Wilson, this poster shows the ship’s track, 3D bathymetry plots from the survey, and images from the ship’s dredging operations. On the poster’s reverse side: background information on site surveys, mini-profiles of some of the expedition’s key personnel, and four science challenges for middle school students.